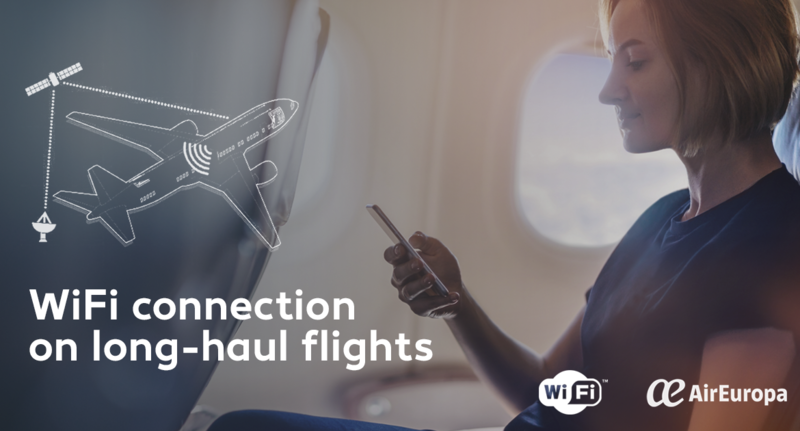 All Air Europa long-haul flights now feature a wifi service after the company completed installation in its Airbus 330 aircrafts. In addition, the fiveBoeing 787 Dreamliners,already incorporated into the Air Europa fleet, feature the eX3 IFE system, offering passengers a unique onboard entertainment experience. The new WiFi service has been launched in collaboration with Panasonic Avionics Corporationwith its new eXConnect system. The system was installed by MR Technics at their facilities in Zurich, who completed cabin modifications ahead of schedule for the new wifi service and reconfiguration of business class in Air Europa’s three Airbus 330 aircrafts. How does the WiFi service work? The WiFi service is activated after the “fasten seatbelt” light is turned off. Therefore, it is not available for use during takeoff and landing. After this point, passengers can connect by keeping their mobile devices in airplane mode and selecting the “Ontheair” WiFi network. Then, passengers simply open their internet browser and select the data tariff most suited to their needs. Air Europa has created three tariffs based on in-flight data usage, starting with the basic tariff of €7 for 30 MB; a more popular tariff of €13 for 60 MB, offering more data browsing time, and a Premium tariff of €20 for 100 MB. Further information can be found on the website of Air Europa. Remember that audio and video files use up a lot of data. Voice calling apps such as Skype, FaceTime or WhatsApp can consume your data package in just a few minutes. It is important to deactivate automatic updates on your mobile device during the flight as they can quickly use up a lot of data. We also recommend turning off background updates for applications. Deactivate automatic image and video downloads in applications such as WhatsApp and Telegram. For your data package to work properly, we recommend avoiding sharing files or accessing multimedia content. Some operating systems and web browsers may not work, such as Windows Phone/Internet Explorer Mobile, etc. Links on how to turn on and block automatic updates in Appleand Google Play. This connectivity service is now within reach of all long-haul passengers, an added value that completes the unique flying experience that Air Europa offers to passengers on all of its flights. We strive to offer our clients the most advanced technology. This forms part of our current expansion and modernisation plan, which includes the opening of new flight routes, the new SUMA loyalty scheme; updating of our fleet with the progressive arrival of the new Dreamliners and Boeing 737 MAX,; improving business class in our Airbus 330 aircrafts with the new flat bed seats, and our new more ecological and sustainable in-flight menus; all of this in addition to other major improvements aimed at boosting Air Europa competitiveness.